You’re looking for small petsitting during your holidays? There are several alternatives you can turn to,which will enable you to go away with complete peace of mind. These options are flexible and adaptable, depending on the species of pet you own. Among small pets, the rabbit is the species with the highest number of pet sitting requests. Rabbits, like other pets, are cherished members of the family and require special attention while their owner is away. Most rabbit owners opt for pet sitting with a family or visits to ensure their rabbit’s welfare while they’re away. And there are more and more pet sitters available, who’ll be delighted to care for your rabbit during your absence. Ferrets are becoming increasingly popular as pets and you can find them in more and more households. For some, ferrets are seen as similar to cats, as they are relatively independent. Nevertheless, we mustn’t forget that the ferret is a carnivore and if you’re looking after one, you need a minimum level of experience or training. Pet sitting for ferrets has grown over recent years, and there are now many sitters who offer this service. 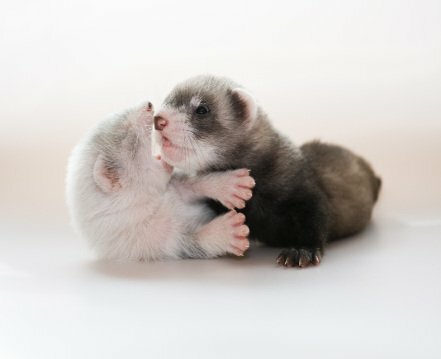 You must however be careful, as the ferret is an animal that is likely to bite if it is mishandled by someone lacking in experience. There are fewer requests for pet sitting for birds, as there are many different species. The birds most commonly kept as pets are: parrots, lovebirds, mynah birds, budgerigars etc. There are some species which are very expensive to buy, so it’s vital that a sitter knows how to look after them. In cases like these it’s unusual for an owner to look for a pet sitter, however there are some species which are easier to look after as they require less attention. In this category, there are a number of different species, some better known than others : chinchilla, guinea pig, hamster, mouse, rat etc. Among small animals, there is a big demand for pet sitters for rodents, especially during the holiday season. In general, rodents are kept in a cage, so it is easy to transport them to a pet sitter’s home. So when it comes to pet sitting for rodents, owners can easily choose between sitting with a host family and overnight sitting in their own home. The choice usually depends on how many animals need looking after.